First I want to explain a few things. There are actually two types of companies: animal control companies and pest control companies. 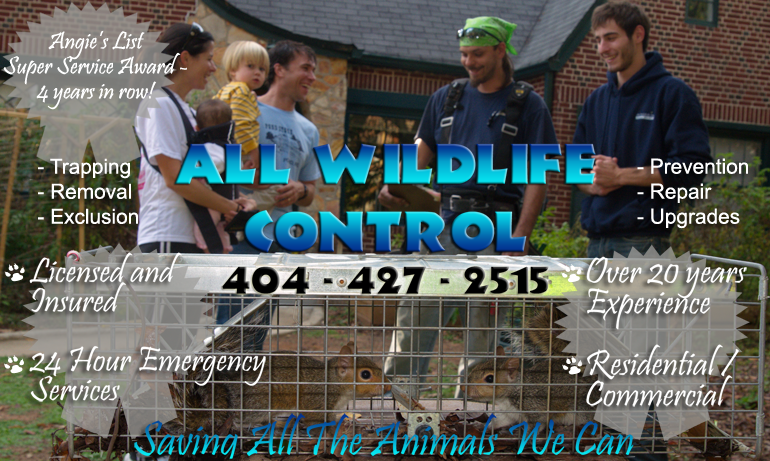 The animal control companies deal with mammals, reptiles, and bees/hornets. The pest control companies deal with termites, cockroaches, and mosquitos. All Wildlife Control is the first type. We deal with any nuisance mammal, such as rats, squirrels, bats, raccoons, and possums; which are the most common, but we can also deal with any other nuisance mammal. We also take care of any type of snake. And we can handle anything that stings, wasps, bees, hornets, and yellow jackets. To explain a little more, the pest control companies used pesticides and are licensed by the Georgia Dept. of Agriculture. We use traps (no pesticides) and are licensed by the Georgia Dept. of Natural Resources. Now, within animal control companies that are actually two types of companies. One type is the trapping company, basically they catch animals in traps. The other type is an "exclusion" company which removes animals from buildings by closing the holes which allow the animal to get inside in the first place. I will elaborate more on each shortly but want to make it clear that All Wildlife Control does both, we are a trapping company and we are an exclusion company. Trapping: Obviously this involves setting up traps with bait and catching animals, sounds easy enough, but it is kind of like fishing for anyone that has sat there all day and not caught anything, animals do not want to be caught in a trap. So trapping is an art, it’s about have the right cage, with the right bait, in the right place, at the right time. 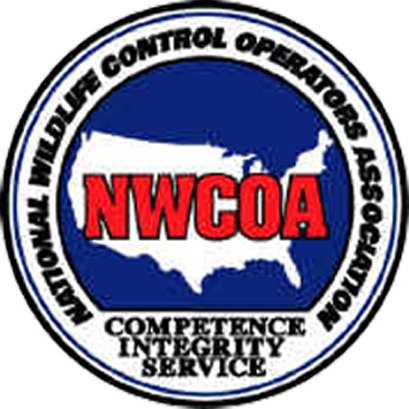 All Wildlife Control utilizes the latest technologies, along with our extensive experience, to greatly increase the chances of trapping the targeted animals. Our prices are very competitive and our success rate is very high. Exclusion: is permanently removing animals from a building. Although this may also seem simple, once again there are quite a few tricks to getting it right. First you have to understand that everything an animal does is exactly what you would do if you were 3 inches tall, that’s because you to are an animal. As an animal you live in your house, raise your kids, and your basic needs are food and water, same with these guys. All animals set up shop based on Habitat, Food, Water. I like to say they just want to send their kids to good schools! But the main point is that just like you, they think they "own" the structure they are living in. It is their house, and they are not going to leave easily. So back to exclusion, the concept is that of a castle, or fort apache, if the Indians are getting over the fence, you have lost the war. So the first trick is that ALL the access points have to be sealed. Let me restate that, 100% of the access points have to be closed, if there is one place that is missed, they will find it and use it to get back in. The second trick is "leverage", rodents already have strong teeth and jaws, if they can get leverage, they can chew through almost anything, so it is not just enough to put steel over a hole, you have to do it so that the rodent cannot gain leverage or they will go right past it and get back in. So that explains the first step in the exclusion process, sealing the house. Close every hole and close it strong enough they can't get past it. Once the house is closed up, we are now dealing with a finite number of animals left inside. The second step is to now remove the animals. There are several techniques for doing this, the most common being an "escape tunnel". Also referred to as a "one way door" or a "check valve", it’s simply a trap door that allows the animal to leave the building, but does not allow the animal to get back in. There are numerous escape tunnels, depending on the type of animal being excluded. The main point is that the tunnel entrance has to over the front door of the rodent so they can find it. In a perfect scenario, they go out, we pull the tunnel, and the job is complete... However since it is not a perfect world, we also place traps inside to catch anything that might not have gone out the tunnel. And in some cases, such as baby raccoons, we may have to physically pick up the babies and remove them by hand. Every problem is a little different from the previous one. We offer free estimates to come out and identify the access points, identify the animals, and explain how best to remove them. We will then write you up a contract should you want us to do the work. Please call the office 404-427-2515 to answer any other questions regarding the removal process, or to schedule an appointment.